-Want to know how graph databases work to provide quick, deep, actionable insights that help with everything from fraud to personalization to go-to-market acceleration, without having to write code or spend operating budget on data scientists. -Learn the new graph uses cases, including 360-degree views, fraud detection, recommendation engines, and social networking. 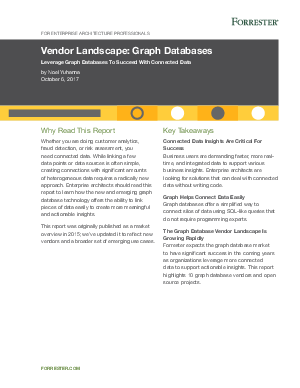 -Learn about the top 10 graph databases and why DSE Graph continues to gain momentum with customers who like its ability to scale out in multi-data-center, multi-cloud, and hybrid environments, as well as visual operations, search, and advanced security.